At the start of 2017 I did something I haven’t done in a long time – I made a new year’s resolution. It was to drink more beer! Specifically, I wanted to broaden my beer horizons so I set myself a target of more than doubling my distinct beers count on Untappd to get to 500. Part of my plan was to use a beer subscription service. I started with Honest Brew and ended up switching to Beer Hawk – reviews coming on both of those. That really helped introduce me to new beers that I might never consider with minimal effort, and at a really reasonable price. I also made an effort to visit some places. Tilt gave me many a new beer including my first ever – and long overdue – Cloudwater brew, Beerbohm has helped me with the Belgians, a new Brewhouse & Kitchen opened up locally and has a decent selection, my local – the Duke of York – has really excited me with a fantastic Beavertown range and some cracking guests on draft, and I took a trip to see what all the fuss was about with Cotteridge Wines (and was not disappointed!). One of the highlights of my year of beer was a little trip to Glasgow. With a weekend free just before a work meetup near the Scottish city, I got myself a hotel for two nights and toured the best craft beers bars I could find. It was great to just have that time to experience the different kinds of places, and the many and various beers on offer. Best though was powering through Craft Beer School (see my review) which I recommend as a must read for any craft beer lover. 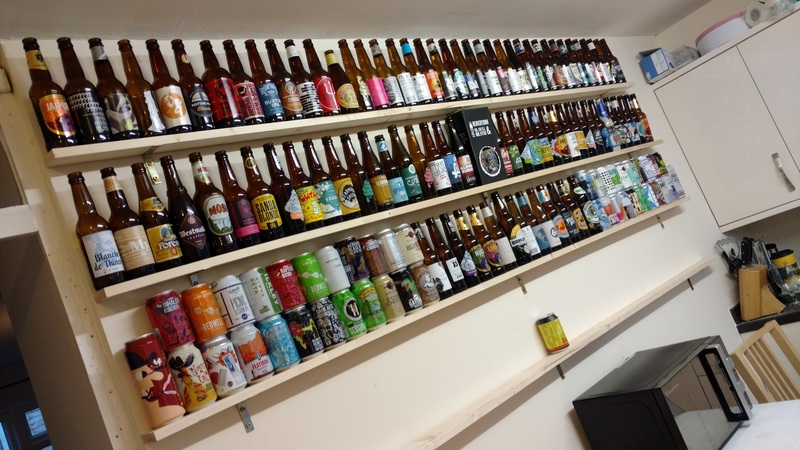 Not content with just checking into my beers I also started (in 2016) to collect bottles and eventually, after having them take over my kitchen, embarked on my most dodgy DIY project yet – bottle shelves! As well as achieving my goal and checking out some great bars, I learned a lot over the year. Much of that was thanks to the Craft Beer School book and the rest about my own tastes. The biggest lesson was learning to like more beer. My taste buds have certainly been helped by this whole effort, allowing me to pick up more flavours and smells and better appreciate what I’m drinking. I can drink beers I would have grimaced at before – from premium macro lagers to sours and lambics. Having a more mature palette was especially visible when I gathered that list of nine above. My most highly rated beers on Untappd are topped by a bunch of 5 star ratings from years ago for beers that I now consider mediocre at best. It’s fascinating how tastes can change and evolve, and that’s really what keeps me interested in this amazing world of craft beer. Equally, I’ve become harder to please. When I’m tasting a beer I’m considering its head, colour, aroma, taste and depth. I’m much more critical now and while I enjoy more beer, I love fewer beers. To some that may sound disappointing but to me it gives me a thirst for more exploration, to find the best beers out there. Since then I’ve really grown to like Belgian beers too. They’re so often malty and rich and it just feels like quality to me. The mouthfeel is luxurious. At the start of the year I’d only had a few sours, too. Craft Beer School taught me more about how they’re made and that really got me interested. I actively sought out sours for a while and I’ve come to really appreciate how complex they are. The biggest lesson about sours – it’s kind of a lottery. I’ve had some great ones but I’ve also had a couple of the dreaded drain pour. In some ways I wonder whether that’s just down to my taste buds needing to mature a little more, but I’m sure I’ll find that out over time. Not only did I try new beer I also tried something else for the first time: selling beer! Good friend of mine Tom, of The Gin Blog, invited me to help him run a bar at the Lichfield Food Festival. I chose four craft beers and we spent a lovely warm and sunny (and at times windy) bank holiday weekend serving craft beer (as well as some gin) to strangers. It wasn’t a money spinner (nor did I expect it to be) but it was a huge amount of fun and an experience I’ll definitely remember (thanks Tom!). I’ve already cancelled my beer subscription. It was great, but I want to try something different in 2018. Partly that’s because it was kinda hard. Yes, it’s lovely drinking lots of beer but I have a reasonably busy lifestyle and found quite often that a new box of beer would arrive and I hadn’t even finished the last box. The sheer volume was a challenge. In fact, I don’t know what my 300th beer was because I ended up barely checking in to anything towards the end of the year. My check-ins show a massive binge on 28th December because I’d grown such a huge backlog. And rather than try new beers I’m going to focus on breweries and go local. Each month I’ll buy a selection of beers from a local (somewhere in the West Midlands) brewery. I know I’ll have already had some, but that’s fine – I barely checked in to anything in 2017 if it wasn’t a new beer, so that’ll change this year. As well as checking in to my beers, I’m going to try blogging tasting notes. So far I’ve been nervous that my tasting skills aren’t good enough to be picking up on the kinds of smells and flavours that I see from others. More recently though I’ve been using the little tasting notes book that Beer Hawk sent me and I’ve been getting on okay. That, plus discussing coffee tasting notes (yes, I’m a bit of a coffee wanker now too) with my new favourite coffee vendor has helped me realise that I can taste, even if not as well as the pros! All that’s to say, it’s been a great year of beer exploration, I’ve learned a ton and I’m going to have lots of fun taking my new found knowledge into 2018.